News & MediaRead, View, Watch. Follow the competition on Facebook, Twitter and Instagram. We will feature live coverage throughout the week on Games.CrossFit.com. Tuesday, Wednesday and Thursday we will stream the Masters competition. You can watch every heat of every event with commentary. Friday, Saturday and Sunday we will stream the Team and Individual competitions to the Games site for viewers outside of the United States. This is the same coverage as what's streamed to ESPN3.go.com for viewers in the United States. Pat Sherwood and Sean Woodland will break down the competition each day on the "CrossFit Games Update." Tune in for live shows on Wednesday and Thursday nights, and come back each morning, afternoon and night on Friday through Sunday for analysis of the Team and Individual competitions. CrossFit Games Director Dave Castro has a record of slowly releasing the Games events throughout the week and Games weekend. We've got cameras on Castro, and we'll give you a front row seat to every announcement. Come to Games.CrossFit.com to find out what's in store for the Fittest on Earth. All of the Masters, Team and Individual events will be covered on ESPN3.go.com. American fans should check with their Internet service providers to see whether they have access. You will need to verify your Internet service provider to log in to ESPN3. 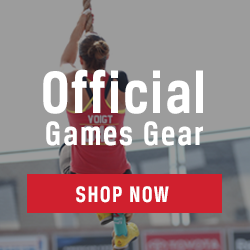 Those without ESPN3.go.com access can still watch the complete coverage of the Team Competition on CrossFit's YouTube channel, and go to a friend's house or sports bar each night to watch the premier coverage of the Individual competition on ESPN and ESPN2. The men's and women's competition will be broadcast live to ESPN on Friday from 6-7 p.m. PT, and Saturday from 5-7 p.m. The final event will run on ESPN2 on Sunday from 5-6 p.m. PT. Our 2014 series of post-production shows are scheduled to debut on ESPN this fall. 07.26.15 / Katrin Tanja Davidsdottir is the Fittest Woman on Earth! 07.26.15 / Ben Smith is the Fittest Man on Earth! © 2015 CrossFit, Inc. CrossFit and Forging Elite Fitness are registered trademarks and 3,2,1...Go!, Fittest on Earth and Sport of Fitness are trademarks of CrossFit, Inc. All Rights Reserved.